1 rare original Scagel fighter knife available. This original William Scagel knife would make an important addition to any premium collection. This knife was sold in the James D. Julia Dr. Lucie Scagels auction. 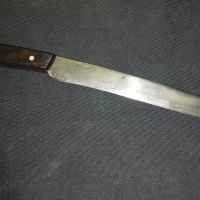 This knife was featured on page 197 of the Julia auction catalog. 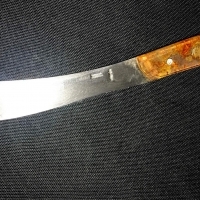 This knife also appears on page 144 of Scagel Handmade by James R. Lucie. The sheath appears on page 64 of Dr. Lucie's book. This knife was described in the catalog as the Rare "Swelled Tip" Style Scagel Fighter. This Scagel has aluminum, black, and red spacers. This knife has a brass guard, and a crown stag handle. This rare Scagel measures 12" overall. The blade measures 7". The front side of the blade is stamped 'W. SCAGEL HANDMADE', as well as the Scagel kris stamp. The reverse side of the blade has the 'V.L.&A. CHICAGO' stamp. This fine Scagel Fighter is in exceptional condition. This knife has some unique staining along the blade--and is in exactly the same condition as it was pictured in the James D. Julia Dr. Lucie auction catalog. St. Croix Blades BUYS Scagel knives. Use the Contact Us link above, email us at info@stcroixblades.com, or call us at 715-557-1688.